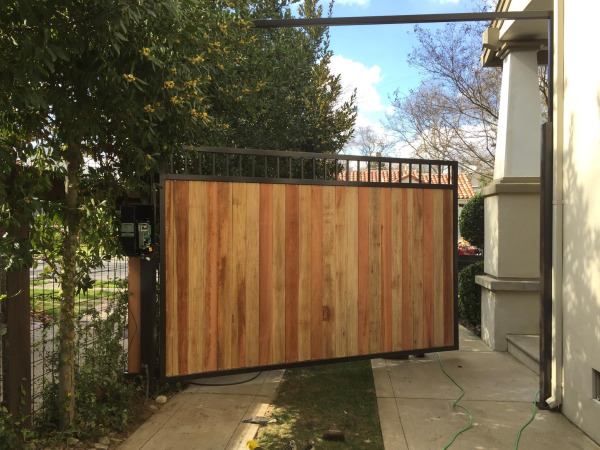 One thing that we have been getting more requests for has been for fences and gates that have a combination of iron and wood or just solid iron with the goal of increasing privacy. Typical iron gates and fences will be made with essentially iron slats which are, although very secure and look great, not as private as a more solid fence. So, to maintain the strength and longevity of the fence structure, our customers opt to have an iron frame, but then use wood to fill in the gaps. Also, there is an added benefit to these kinds of gates and fences… One of the most common reasons that the usual all woof structures get blown over or need to be repaired/replaced is as a result of wood rot in the fence posts. however, when you have an iron frame around a wood fence or gate you prevent this from happening and therefore significantly increase how long it will last before needing any repairs. Another not so new trend, but one that is still rising in popularity none the less, is initials. This is kind of design is more often found in gates and not so much in fences, but people will often want to have initials, crests or the first letter of a family name. typically our customers will want to add this to create a sense of a family legacy around their home. With do many different design options and ways to make it unique to you, this kind of accent is a great way to add your original flair to your wrought iron gate. 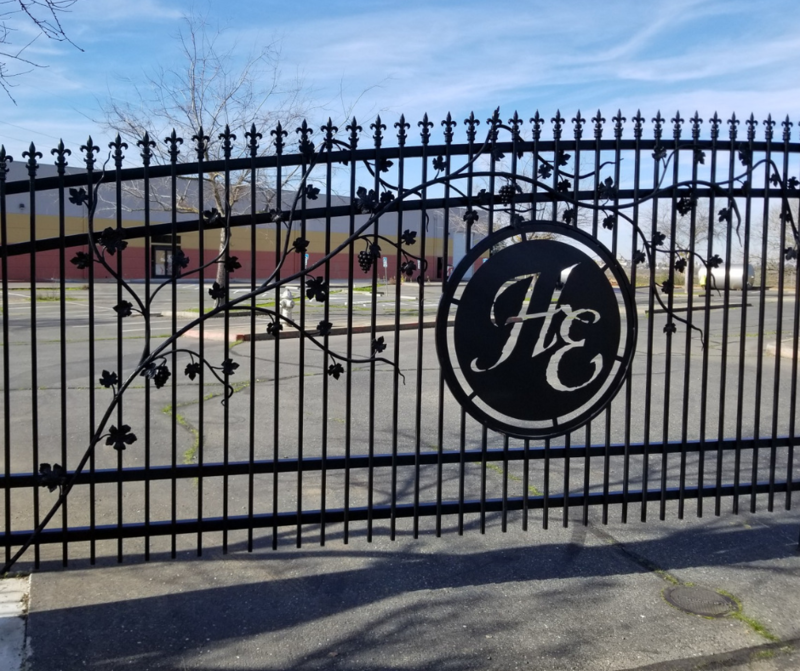 One of our favorite kinds of designs and a rising preference for our local customers is the fusion of the old colonial style mixed with a contemporary influence to create simple, timeless elegance in your fence or gate. Using worn brick or concrete, foliage and a simple, yet elegant iron fence or gate can create a design above all. If you have a colonial style home, brick accents or any worn concrete around the perimeter of your property, we would definitely recommend finding a way to incorporate that style into the iron fence or gate that you have added to you home. This style becoming more trending is actually as a result of more customers opting for iron fences ad gates as apposed to wood or vinyl. The reason being is that wrought iron can be molded to fit almost any shape and maintain its integrity, making it the best material to seamlessly go around curves, up and down slopes and at angles that may be difficult for other materials. This kind of seamless design creates so much more elegance in your home and even a more pleasurable experience for people during social gatherings. Lastly, a trend that we are seeing more and more is the use of complimentary ornamental iron all around your home. Rather than the usual iron gate and wood fence, we are seeing people more and more use wrought iron all around their homes. From iron fences and gates (which is more common) to iron railings throughout the home, indoor and outdoor spiral staircases, it seems like many of our customers want more ornamental iron in and out of their home after getting the initial project installed. Overall, these are the top ornamental iron trends that we are seeing for 2019. If any of these have inspired you or you are already looking for some ornamental iron work for your home, then please reach out to us at my personal email, bill@irishiron.com, or you can call us at 916-269-0882 For us to go over the design and get you a free estimate. We look forward to talking with you!